← Bedrich Holzner – Toužim, 3.8.2018. & 4.8.2018. Neúcta k pomníku okřídleného lva! 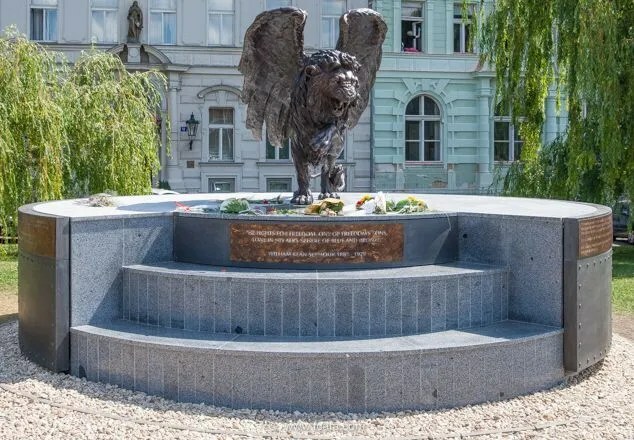 In June 2014, the Winged Lion monument was unveiled at Klárov, Prague; a gesture from the British ex-pat community in the Czech and Slovak Republics to thank Czechoslovakia for its men and women who served in the RAF during WW2. V červnu 2014 byl v Praze na Klárově odhalen „Okřídlený lev“, gesto díků komunity britských migrantů v České republice a na Slovensku určené československým mužům a ženám, kteří sloužili v řadách RAF v průběhu druhé světové války. 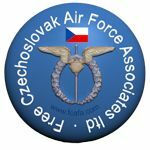 In November 2017, phase II of this project was completed with the inclusion of panels listing the names of those 2507 Czechoslovak men and women who had served in the RAF. V listopadu 2017 byla dokončena druhá fáze projektu zahrnující panely se seznamem jmen všech 2507 československých mužů a žen, kteří za druhé světové války sloužili v RAF. Both these events received high media coverage – and not just from Czech media – so good PR for a few. All very grand! Oběma těmto příležitostem byla věnována velká mediální pozornost – a to nejen ze strany českých medií – skvělé PR pro tuto malou skupinku. Dosud všechno v pořádku. Bohužel, všechno není tak růžové, jak by se na první pohled zdálo. Monument přitahuje každý rok velký počet návštěvníků, kteří přicházejí projevit úctu těmto 2507 statečným. Zároveň ovšem přitahuje lidi z problematické části společnosti požívající nestřídmě alkohol, neuvažující o tom, kde a jakým způsobem zanechají svůj podpis. 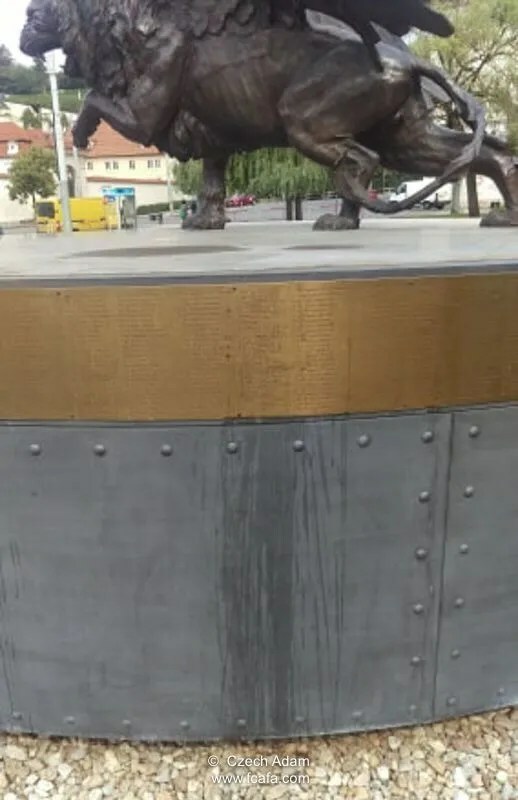 The monument, at Klárov park, is in a very public place but that has been no deterrent to such disrespectful behavior which is not just limited to night time but also in broad daylight as well – hardly pleasant for people, including children, at the nearby tram stop to witness. Pomník v parku na Klárově je na veřejném prostranství, ale není u něj žádné značení odrazující od takto urážlivého chování. Toto chování se navíc neomezuje pouze na noční dobu, dochází k němu i za denního světla, což je jen stěží příjemné pro ty, kdo jsou nuceni přihlížet, včetně dětí na nedaleké tramvajové zastávce. 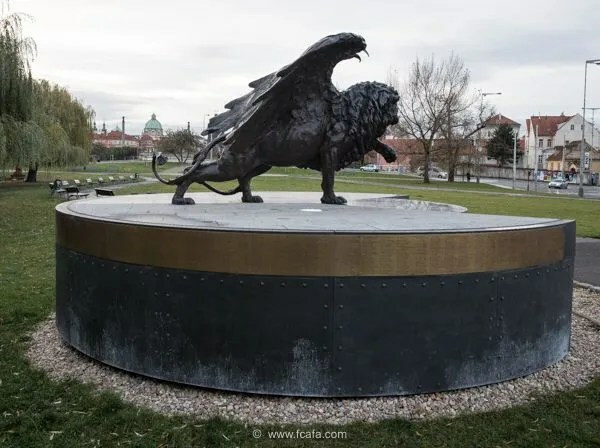 The Winged Lion monument has been owned by Prague 1 Municipal authority for some years now and is their responsibility to maintain and keep in good order. A more pro-active is required from the authorities to curtail this current level of disrespect and abuse being seen at this monument. It is simply just not good enough to send a small team to clean up the monument on the morning when a ceremony being held there later that day! The authorities certainly have the manpower and resources to fine errant parking motorists in adjacent Uželezné lávky, the small road running along Klárov park, and so a useful revenue source. 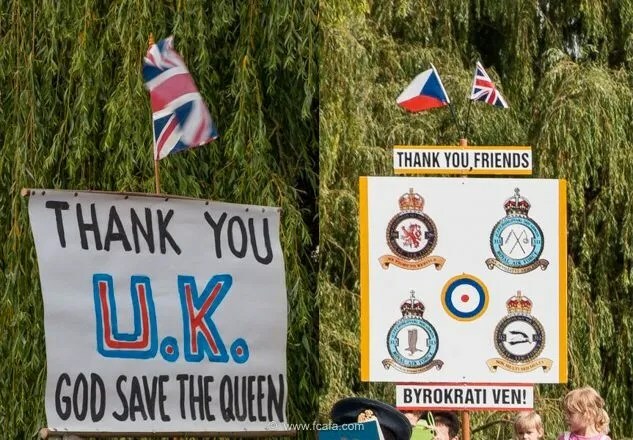 Has it now merely become a case of where priority to a revenue source is more important than preserving a hard-earned legacy – 512 of those 2507 RAF died in WW2 to provided that legacy – which was denied to the nation for so many years under its former Communist regime? „Okřídlený lev je už několik let v majetku místní části Praha 1 a je na zodpovědnosti jejího vedení udržovat pomník v dobrém stavu. Omezení současných projevů vandalismu a neúcty namířených proti tomuto pomníku vyžaduje více aktivity z jejich strany. Nestačí prostě poslat k němu několik pracovníků, aby pomník očistili ráno toho dne, kdy se zde koná slavnost. 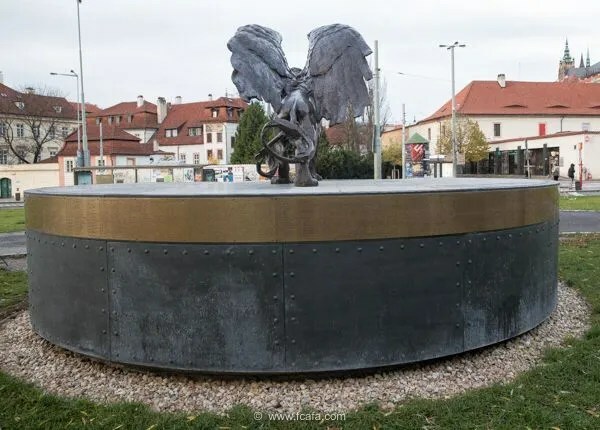 In the various social media channels, a common topic amongst RAF re-enactors is ‘going to the Winged Lion in their RAF uniform to pay their respects’ but where are they when it comes to ensuring that that monument is treated with respect? 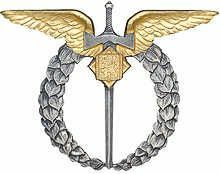 V rozličných veřejných médiích je mezi “RAF re-enactors“ častým tématem „návštěva Okřídleného lva v uniformách RAF jako výrazu úcty“. Kde ovšem jsou tito lidé, když je potřeba zajistit, aby se k pomníku přistupovalo s respektem? 8 Responses to Disrespect at the Winged Lion Monument! I have re-blogged articles from this site before. It concerns a very important chapter in modern history. Unfortunately, it is chapter many choose to dismiss. What shall we do? Stand guard nonstop there? They was our heroes…and we respect them and RAF so deeply…never don’t forget about them and in every second of our lives we remind them and we teach about theirs lives anyone who want to listen…. I have to say, that all those things are not only the action of Czech people. Personally, I was talking to two girls which were English speaking and sitting on the monument. They were so surprised that I am asking them to go down. They told me that they can to do what they won’t and now they want to sit on Lion. I was trying to explain to them, what the Lion represents, but no any word of excuse or so. I am very sad about that all things. I have to second Petr Doktor. Today’s generation has no respect towards anything of the value, doesn’t hold anything dear. No respect for all those heroes, their sacrifices. Not to many people today know or remember their persecution. This is all generally speaking, because I believe there are still good people around. It makes me very sad when I read about such disrespect. My father’s name is on the monument, I am coming from Canada where we live in September and hope to find it clean. 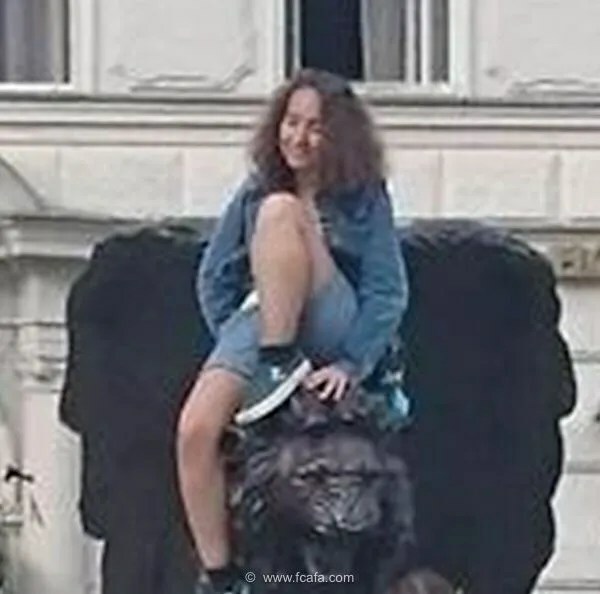 I can’t imagine my action in case seeing a young women siting on the statue with her immature and stupid smile or worse……. I’d like to know what would have happened to anyone found urinating on a statue of Stalin from 1948 to 1989. Very sad to see and hear but unfortunately all far too common. The morals of some people are distinctly lacking. What do you expect from the society where velveted communists who prosecuted our heroes are still in power? Shame of them for ever. 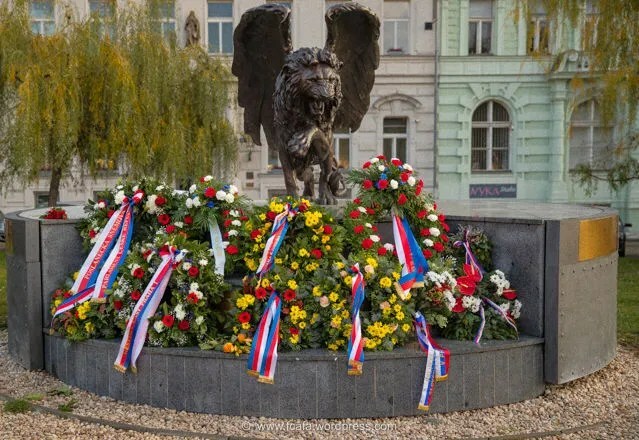 Very many of us in the UK will NEVER forget those 2500 brave Czechoslovakian’s – during both the WWII 6 year period, and of course the most dreadful period from 1948 onwards !